There are 143 reviews of Original Santal. I have tried several Creed's and find this to be a super fresh and clean juice. Not offensive. I would say go easy on the trigger with this one due to it's strength and longevity (at least on my skin). Starts strong with spices and juniper. Once that dies down the sandalwood hits it does last for hours on my skin. I do pick up vanilla in the dry down to add some sweetness. A try before you buy due to cost but I do think most people would be pleased with this juice. Enjoy! You can find many juices that smell alike in the popular beauty stores. It smells alot like La Male - one of the versions, don't remember which one right now - not the original one. - it's pretty generic, smells mainstream, youthfull, not mature. It's not sophisticated as other Creeds. But then, Aventus is also very youthfull to me, so I guess it's a matter of taste. I feel that such a word may also be useful - I know I appreciate such descriptions. - I'm trying to not go in too deep, to describe the impression as it is - from my straight male perspecitve. I like interesiting scents - this one just isn't. Really nice smell playing in the air, clean, fresh, sweet, my girlfriend loved it. Mont Blanc Individuel, I don't find MB pleasant. I can perceive the quality of the smell coparing both. I am not an expert on smelling different notes, etc. etc. Nothing new or exciting, just a clean smell, but if you enjoy this type of perfumes (JOOP, MBI) you will not be disappointed. My advice get the real thing, good deals on discount sites. 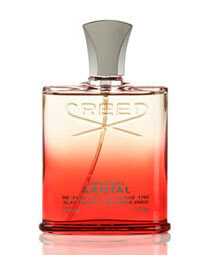 Is Creed's Original Santal a gourmand? Is Creed's Original Santal an oriental? The answer to that, as the appreciation of this, will of course depend on the nose of those who smell it. The immediate feeling and image it evokes for me: The most delicious bowl of oatmeal by the fire place I've ever had! This offering from the prestigious House of Creed is a wonderful combination of sandalwood, vanilla and tonka beans at all three phases, all three masterfully accompanied by a warm cinnamon note that compliments each of them as well crafted as Ive ever experienced the spice. After sampling this from a decant, I discovered the fragrance come alive off of me in the 108 degree Texas heat, truly defeating a misconception of these types of fragrances being most appropriate during the cooler autumn and winter seasons. I highly encourage any inquisitive fragrance fan to sample & try out this offering to see what feelings it evokes in you, and if you enjoy your time with it as I have. Creed Original Santal vs Bois Du Portugal for a young guy? Cadillac Black, clone of Mont Blanc Individuel or Creed Original Santal?